It was a cold February morning on the outskirts of Edinburgh and Anke Bremer was digging through sea grass. “The beach was pretty cold and a bit barren, for a while we couldn’t find anything,” she recalls. For twenty minutes Bremer and five others in her group scoured the beach, until they found what they were looking for: a nurdle, a tiny plastic pellet, no larger than a lentil. It was not long until they found hundreds more. The group were taking part in The Great Nurdle Hunt, a nationwide search for tiny plastic pellets that often litter the UK’s shores. Over one weekend this month, around a quarter of a million plastics pellets were found on beaches across the UK. The small resin pellets are essentially the building blocks of plastics. Produced by companies like Dow Chemicals, BASF and ExxonMobil, nurdles can then be easily transported around the world, to be used in a wide variety of plastic products. But things can and do go awry. According to Maddy Berg from Scottish charity Fidra, spills and mishandling can lead to nurdles ending up in oceans all over the world. And some spills are larger than others. In 2012, for example, 150 tonnes of nurdles tipped into the seas near Hong Kong. Chinese oil major Sinopec later offered to pay $1.3m to clean them up. 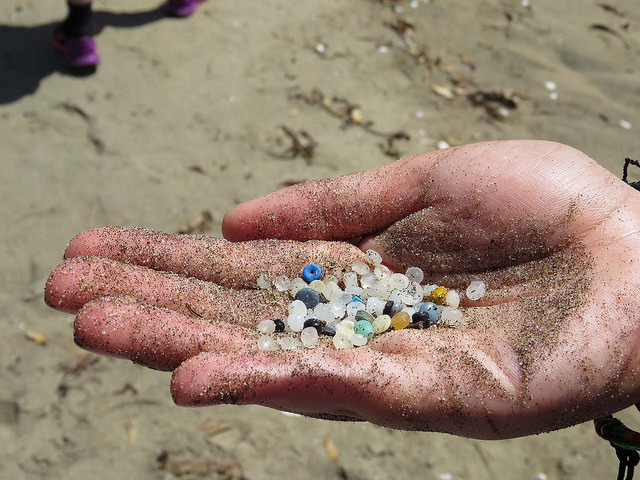 Through the Great Nurdle Hunt, Fidra hopes to document where nurdles and in what quantity nurdles are found. Last week more than 160 groups headed to beaches from Isles of Scilly to the Shetland Islands. Around three quarters of those groups reported finding nurdles on the beaches they checked. Hunters at Widemouth Bay in Cornwall reportedly found more than 127,500 of the pellets on their beach alone. On Seton Sands, just outside Edinburgh, Bremer, and her group found nearly 300 plastic nurdles in around and hour and a half. “Once you get an idea of what to look for and where to look it gets a bit easier and you have to get really down on your knees and carefully look,” explained Bremer, who is also part of Greenpeace’s volunteer network. The group also found other rubbish: “we found loads of fishernets and really weird stuff, wellies and lots of wet wipes too, really really a lot of garbage on the beach”, Bremer added. Fellow team member Alison Buckle explained why she was so concerned with their plastic haul. “It’s a huge problem, there is a massive amount of plastic in the sea. It constitutes quite a biohazard, because plastic accumulates and absorbs all of the toxins that are in there. There are toxins in the sea that have been banned for years, that we don’t even produce anymore,” she told Unearthed. Spills can have a serious impact on ocean life. As well as the potential for sea creatures to ingest the pellets, a new scientific study, published in December in Water Research, revealed that toxins leaching from the pellets can have a harmful effect on marine life. The study found that microplastics in the ocean attract and absorb contaminants in “extremely high concentrations”. Tests on brown mussels, found that these leachate toxins, from plastics like nurdles, had a negative effect on the embryonic development of the mussels. But when it comes to who is responsible for this ocean plastic, a nurdle’s origin can be hard to trace. But that responsibility has been hard to pin down. There is voluntary scheme for plastic producers. Operation Clean Sweep is designed to encourage plastic producers to take more care with nurdle pellets. However, according to Berg the scheme is far from perfect. “The guidelines on the scheme are very sensible and if everyone followed them then pellet lose would be easily limited. But only a very small fraction of companies have signed up but there isn’t any kind of checking or reporting involved. These companies are basically just promising to reduce pellet loss but no one checking whether they have fulfilled that promise,” said Berg. Instead, it is left to volunteers like Anke and Alison to clean up the mess and document their finds. And it is the survey and coordinated mapping that Anke found the most rewarding. Fidra are now encouraging anyone that finds nurdles to log their finding on their website. The Great Nurdle Hunt project is run by Fidra. The Great Winter Nurdle Hunt event took place 3-6 February in collaboration with the Environmental Investigation Agency, Fauna & Flora International, Greenpeace, The Marine Conservation Society and Surfers Against Sewage, supported by many more local community groups and charities.